With Open House coming up this week, I thought I'd tell you a little about the work I chose to display. One assignment I gave the kids at the very beginning of the year was to incorporate numbers into a page about their own lives. 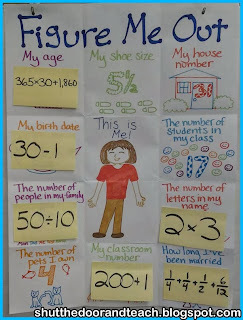 Although I've seen this sort of assignment called "Math About Me" elsewhere, I added another layer to the page of birth dates, shoe sizes and number of pets. 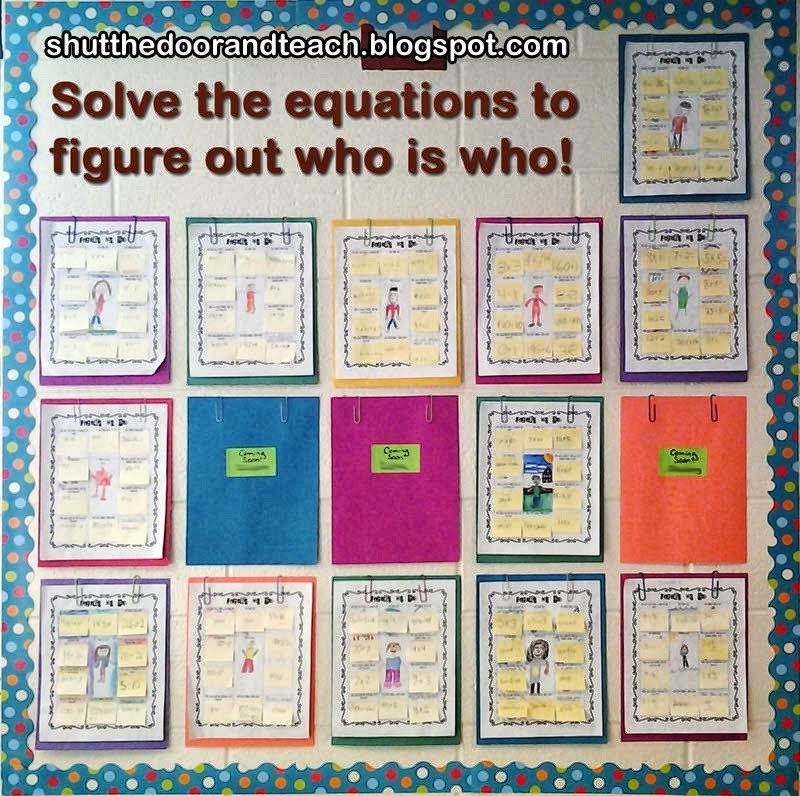 I challenged my fourth graders to create an equation for each number on their page. I started out VERY simple: 200+1=201, my room number. I told students "If you remember how to do expanded form, you can." Of course, this was the simplest sort, but it gave them confidence on that second day of school! On the other hand, on my example I included a couple of fraction questions (one simple that many kids were able to figure out, and one that none of them were able to figure out). There were 3 out of the 8 equations in my sample that I thought would be too hard for them at this point in the year, because I got to promise them, "By the end of the year you'll all be able to figure these out." I made it a mystery and they were all begging to let them see the answers, haha. I required an addition, subtraction, multiplication, and division equation, and they were in fact all able to do it! I told them I would allow them to use between 2 and 4 numbers per equation. This way I laid the gauntlet down for problems more interesting than 5+5=10, but not the super annoying 1+1+1+1+1+1+1+1+1+1=10, haha. These equations were each written on small sticky notes that fit right over the answers. The result: anyone walking through the hall can see the topic (My age) the equation (8-3+5) and try to solve it before peeking at the answer. I think parents would enjoy looking for their child's work (the self portrait in the center is a hint that didn't take up too much time from the actual math learning). Update: If you like this activity, Figure Me Out is now available for purchase in my TPT store, Amber Thomas's Classroom Favorites! The worksheet, a student checklist that you can use as a grading rubric, 2 pages of instructions, and even 10 pages that you can edit (to include your own shoe size, birthday and so on) and use as a sample poster are included in the product. What a great activity to start the year! 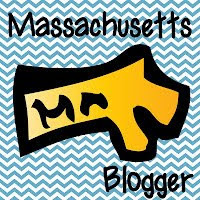 I'm excited to have found another 4th grade blogger! Love this! Will be using come this August! I loved this idea so much that I changed my plans for the day to use it with my third graders for multiplication and division. I want to blog about it but I don't want you to think I am stealing your idea, can I blog about it if I link to your post? I just LOVE it and the kids did, too!!! This is great. Will use addition and subtraction for my 2nd graders! Can't wait to try it. I have no idea how I stumbled onto your page, but boy am I glad I did! Great idea. That's so kind of you to say, thank you! I love this idea! I am going to use it as the first page of my students interactive math notebooks! Can't wait to see what equations middle school students come up with for the numbers! Thanks for sharing! I love this! I will be sending it home for my students to do as a home project. Do you happen to have kid-friendly directions? I read the directions, but they are more for teachers. Thank you for your interest! Ideally, I would model sticking the Post Its over the answers, as shown on the poster. You could print a photo of the poster for students to view what the Post Its look like at home. I would also suggest sending home the rubric along with the project page. Because this project is in Word format, you can tweak the requirements to suit the age level of your students. Letting them know what they are being graded on will help them rise to the challenge. I hope your kiddos have fun with this project! 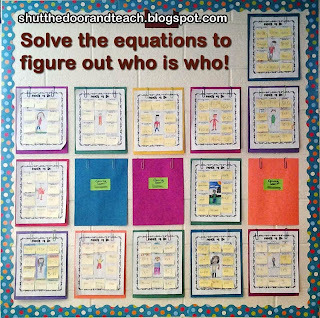 What a great idea for relief teaching. I am going to purchase from your TPT store but just wondering what size paper would you do this on A4 or A3? Thanks. A4 would be the better choice. In America 8 1/2 by 11 inch paper is standard. A4 is about a centimeter too narrow and a little longer. If you have problems with printing or formatting after you purchase it let me know and I'll see if we can work something out. 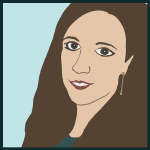 Awesome, thanks for your reply :-) I can not wait to try this out with a class. 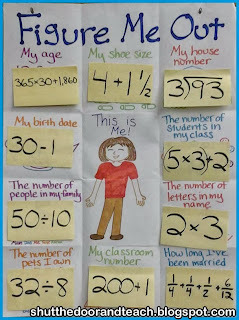 Love this idea , am stealing it....and using it definitely in my first class as an activity tomorrow. I think that is an equation to express her age in days. There are 365 days in a year times the 30 years she has been alive plus an additional 1860 days. 365 X 30 + 1860 = 12810 days. 12810 days divided by 365 days in a year is approximately 35 years.